Here is a Christmas Island endemic to celebrate the festive season appropriately. It’s not the most spectacular bird but all the other birds with ‘Christmas’ in the name that I’ve photographed have already featured as bird of the week. Happily, it’s quite partial to posing beside spectacular flowers, first and third photos and its endemic status gives it special significance. The first two photos were taken at the Christmas Island Resort on the eastern side of the island, – that’s Christmas Island in the Indian Ocean, not Christmas Island (Kirimati part of Kiribati) in the Pacific. The resort used to be a casino for Indonesian high-rollers, opened by an enterprising entrepreneur in 1993 following the closure in 1981 of the three licensed Indonesian casinos in Jakarta, a mere one hour away by private jet. It closed in 1998, a victim of the Asian financial crisis and was empty when we visited it in 2006. It has recently reopened as an ordinary resort, promoting more socially acceptable activities such as honeymoons and bird watching. The White-eye is quite abundant on the island. The third photo was taken in the grounds of Government House, where the Governor used to live. It was also empty in 2006, the Administrator choosing to live in more democratic surroundings. Government House is just across the bay from Flying Fish Cove and it is good for bird watching. If I were Administrator, I would prefer to live there. There is supposed to be a small population persisting in the Cocos (Keeling) Islands, introduced between 1885 and 1900, but there is disagreement between Handbook of Birds of the World and BirdLife International as to where it survives (Horsburgh Island or around the settlement on West Island, respectively). Anyway, below is my best wishes for Christmas and New Year. I’m avoiding ‘Merry’ as it suggests drunkeness and ‘Prosperous’ as it seems a bit greedy, so interpret the message how it accords best with you. This was a pleasant surprise article from Ian. Wasn’t expecting one so soon. How appropriate though. I especially love that first picture. White-eyes are members of the Zosteropidae – White-eyes Family. There are 128 species that make up the family, of which 96 are White-eyes. 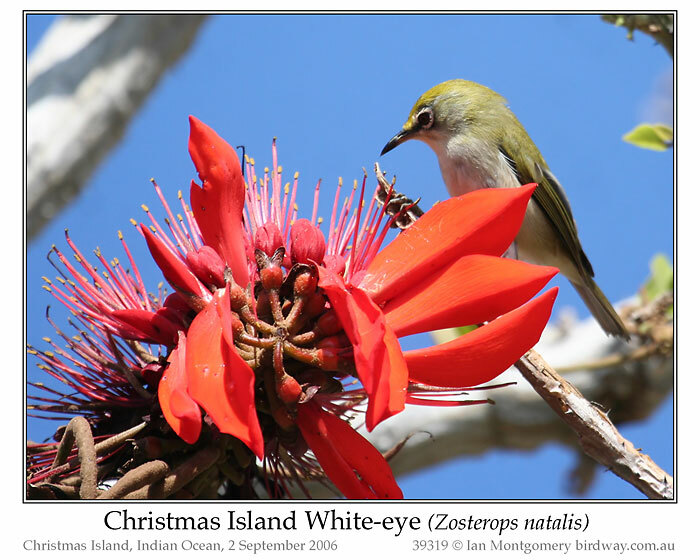 This entry was posted in Bird of the Week, Birds, Birdwatching and tagged Christmas, Christmas Island, Ian Montgomery, Indian Ocean, Nature, Photography, White-eye. Bookmark the permalink. I am sure you will like it !! Beautiful shot! It reminds me of the Lord Howe Island white-eye which is endemic to Lord Howe, but looks different. The Christmas Island white-eye looks more robust. They are not easy to photograph as they keep moving, well done! Thanks for all the comments. Merry Christmas!